Our intimate resort features 25 deluxe, private air-conditioned villas(called bures) spread out beneath the lush tropical landscape. 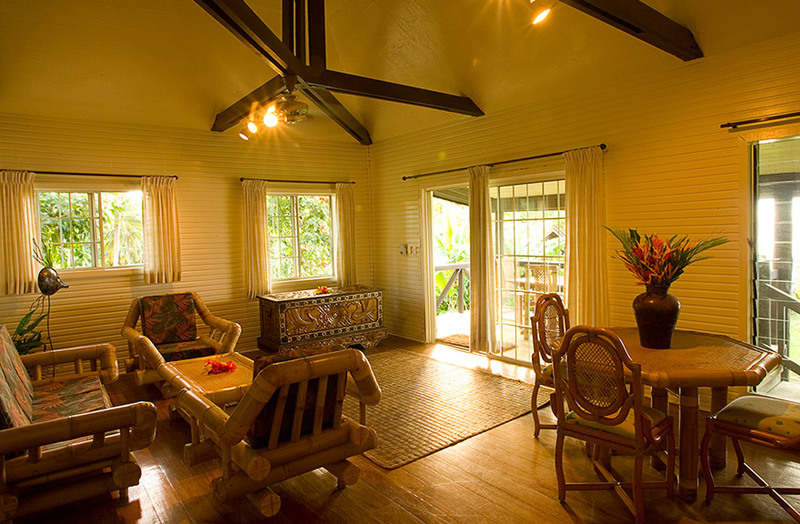 Each of these generously sized mini-suites are beautifully appointed with traditional island dècor. 12 stunning beachfront bures grace the shoreline, each with their own private courtyard, large sundeck and cool plunge pool. One of the beachfront bures is designated as our honeymoon bure featuring premium ocean view, upgraded contemporary interior and even a romantic outdoor shower. 6 charming bures surround our koi pond and 3 very private bures are tucked away in the garden. For families or groups we suggest one of our 4 comfortable and spacious two-bedroom bures. Each of these are about 1,000 square feet with 2 private bedrooms and a large living and dining room area. Enjoy soothing ocean views from your private patio or balcony. Photo copyright Beqa Lagoon Resort. In the heart of the South Pacific, beneath Southern skies, lies the island paradise of Fiji. If you travel to recreate, enjoy fine food, if you are looking for romance, or simply want to relax in a tropical paradise, Beqa Lagoon Resort (formerly Marlin Bay Resort) is what you're looking for.